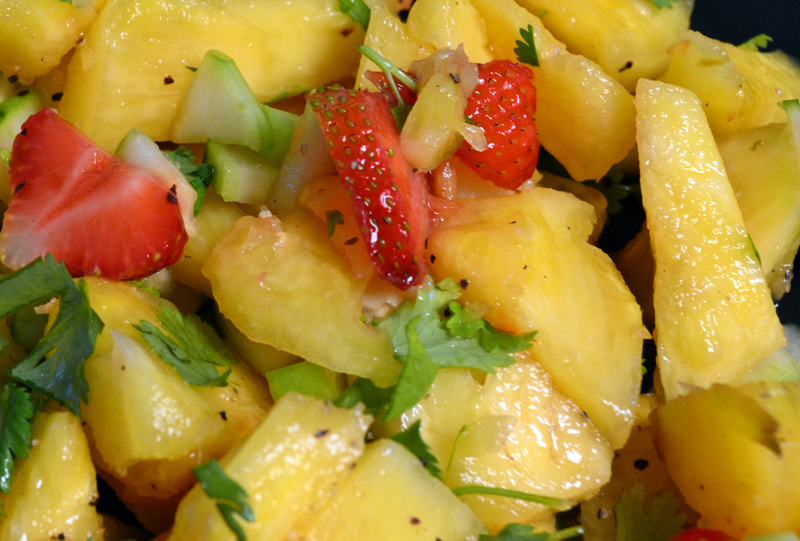 Not just another fruit salad. This fresh-tasting salad works as a dessert, side dish, or even a between-meal snack. The lime juice is the only dressing necessary. Many people don’t care for cilantro and you can use parsley if you must, but it’s the addition of cilantro and cucumber that makes this unique. Using salt and pepper sounds a little odd, but they do round out the flavors. 1. Combine all ingredients and toss lightly to distribute the lime juice and zest evenly. 2. Season with salt and pepper if desired. 3. Serve immediately or keep chilled until ready to serve. This entry was posted in Cooking Light, recipes and tagged cilantro, cucumber, fruit salad, pineapple, salad, strawberries. Bookmark the permalink.